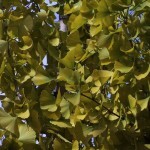 This ginkgo is a male cultivar with a symmetrical, upright branching habit. 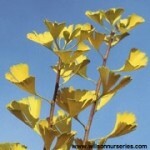 Fan shaped leaves turn a bright yellow in fall. Can tolerate urban conditions including salt and air pollution. A fruitless male cultivar. A reliable performer that features strong, upright growth with dominant central leader. Faster growing and with a slightly broader form than G. ‘Princeton Sentry’. Pyramidal form makes it excellent for use as an urban street tree. A fruitless male cultivar. A columnar selection which is often specified for narrow street plantings. Stiff, upright branches form a narrow pyramidal crown. 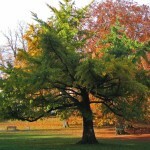 Hailed as “undoubtedly one of the most distinct and beautiful of all deciduous trees,” the ginkgo certainly stands out. 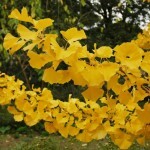 Unique, fan-shaped leaves turn a stunning yellow color in the fall. It can tolerate many urban conditions including heat, air pollution, salt and confined spaces. And it establishes easily. This tree also comes with a bit of history. It is a living fossil, with the earliest leaf fossils dating from 270 million years ago.